but when i visit it and login and accept to scan my computer it tell me Service Tag is already registered or is invalid. Ensure you have entered Service tag correctly. Ex: Entering 0 instead of O and B instead of 8. Close all Internet Explorer and Windows Explorer windows that are currently open. Click the Advanced tab, and then click Reset. Select the Delete personal settings check box if you would also like to remove browsing history, search providers, Accelerators, home pages, Tracking Protection, and ActiveX Filtering data. In the Reset Internet Explorer Settings dialog box, click Reset. When Internet Explorer finishes applying default settings, click Close, and then click OK. Your changes will take effect the next time you open Internet Explorer. Please try the steps and check if that works. Kindly write back if you have any further queries. To know more about Dell Product Support, Drivers & Downloads, Order & Dispatch status -> choose your region US; India. For Dell support videos click Here. Unfortunately we have not received feedback from you on this topic. If you need continued support, please write back. Other community members who need assistance please start your own topic in a new thread. and simply even i wrote it wrong i can make the page detect it and my service tag is ??????? I apologize for the inconvenience caused. In order to assist you further, I’d request you to private message the following details listed below. To private message, click on my user name and click start conversation. I would also request you to edit your previous post and remove the system service tag for security reasons. To edit the post, click the green pen and edit the post. Please write back with the details, I'd be glad to assist further. 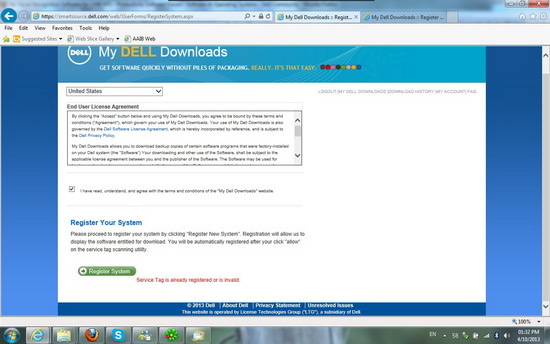 sorry sir but do you think its normal to ask all this questions to allow me to get my laptop software? plus how you expect me to give you my password for my login to the forum here? I really apologize for the delay in response! I have also received your private message and I would be replying to it. I have also replied to your private message. Please try the step and write back with results.